Lo and behold, dear listeners, we have returned! And with us, we bring special guest star Matthew Kessen, who has been dying to talk A LOT about Shin Godzilla! 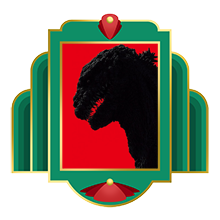 There is also a special segment at the end that was recorded the same night that Shin Godzilla opened in Minneapolis. We apologize for a couple spots of audio weirdness in that segment (the audio goes briefly from stereo to mono back to stereo), so if you think your podcast playing device has suddenly gone wrong, we assure you that it hasn’t. If you would like to drink along with us, we recommend either Cupcake Red Velvet wine (Windy’s pick), Surly Hell beer (Melissa’s pick), or Spring Grove Rhuberry soda (Matt’s non-alcoholic pick). All three are delightful! Welp. I might as well listen to this one; Shin Godzilla has left my city before I could get money enough to go see it. I’m guessing it’ll be a while before I can buy/stream it.